Finding a well-lit macro subject inside my house on a dark January afternoon is a challenge but yesterday I spent some time studying an old ship’s lantern on our mantel. The brass and glass light above is one of a set of three from my father-in-law who spent his working years sailing the world, away from home for up to six months at a time. When John was small these long voyages felt like forever but when Joe returned he always had an exotic find and at least one wild story to share with the family. Some of these finds have made their way to our home now and listening to John tell Ryan about Grandpa Joe’s travels brings Joe back to us too. Posted as part of Lens and Pen by Sally’s Phoneography and Non-SLR Digital Devices Photo Challenge: Macro. The finish is reminiscent of an oil painting. Very cool. Thanks, Nancy. This was a really simple shot that I edited in Oggl with the Chivas/Blanko 1 combination. Glad you like it. My first impression was also that of an old Dutch master’s oil painting! Nice colors and mystery. Really engaging image–well composed and processed. But the combination of the object and your story made it all the more enjoyable. Happy Photo Challenge. 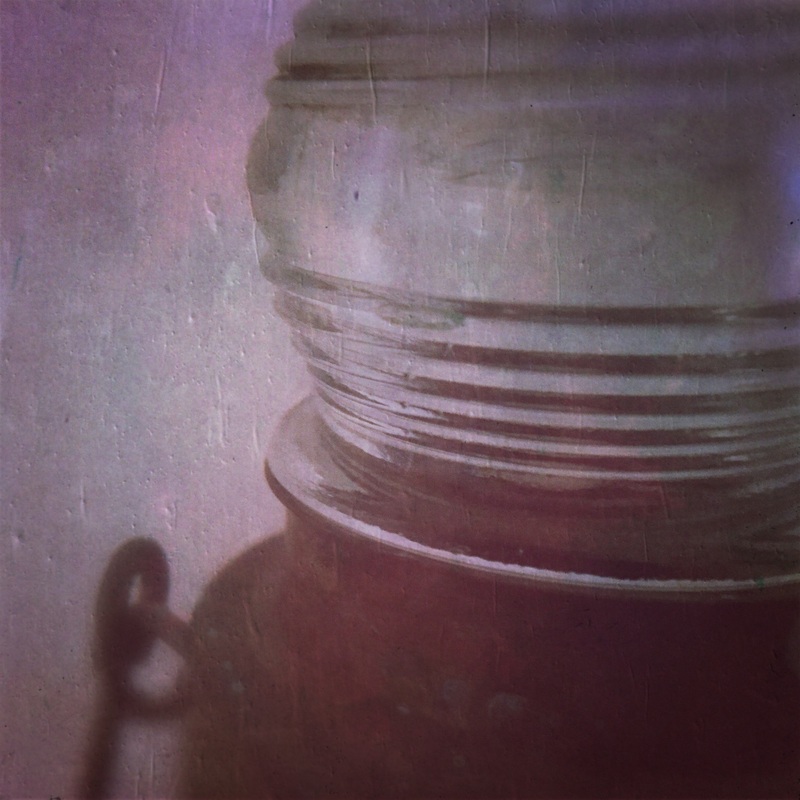 It’s nice to hear you like the processing and the story behind the lantern Sally. Thanks! Beautiful memory and precious old ship’s lantern! Love this photo, Lisa! Happy New Year to you too, Stacy! Lisa, that stories you heard must have been fascinating. Did anyone ever write them down? I like the photo as well. I wish someone had written them down but Joe was the historian in the family and although he kept wonderful pictures there aren’t a lot of recorded stories. We’re making an effort to gather some of the good ones now though from everyone who’s still here. You captured the object beautifully, Lisa. How wonderful to have items that have such a story and are attached to the memory of someone special! I’m glad you liked the story, Jo. 🙂 If I can get my new scanner up and running I’ll share some of Joe’s great mid-century travel photos and postcards over the next few months too. Thanks so much, smiling toad. 🙂 It’s wonderful to hear when a post resonates with someone. Cheers to you too! How evocative… I love your take, Lisa! Thanks so much, Paula. I was at a loss for an interesting subject until I took a second look at this light. I’m glad you enjoyed it!